One of the newest schools in the Illinois Solar Schools Program is Kewanee High School in Kewanee, Illinois. The installation is a 1.25 kW PV system using 5 REC 250 watt solar panels and an Enphase inverter. 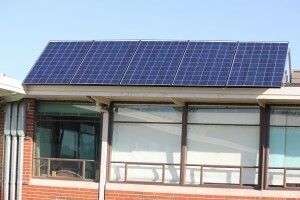 The panels sit at a 35 degree angle and are mounted on the edge of the roof so they are visible to the students at the school for this school year and for many years to come. Kewanee High School offers unique programs for a rural school.Â Kewanee High School offers a wide range of Career and Technical Education courses in business, family and consumer sciences, agricultural, woods, and metals(including welding). Along with our traditional educational programming, students at Kewanee High School are offered multiple avenues to explore in order to prepare them for life after graduation.Â Kewanee High School also offers â€œdual creditâ€ courses with the local junior college, Black Hawk â€“ East Campus. These dual credit courses allow students to earn both high school and college credit at the same time for a nominal fee. This entry was posted on Friday, April 5th, 2013 at 1:12 pm and is filed under District of Columbia . You can follow any responses to this entry through the RSS 2.0 feed. You can leave a response, or trackback from your own site.